The fourth and penultimate season of The Wire sees the show moving into new territory. At the end of Season 3 the Barksdale organisation was finally destroyed for good, McNulty found himself some happiness and Daniels got a promotion. The goals set out in Season 1 had been achieved. So, where next for the Major Crimes Unit and the players of the game? Season 4 follows several storylines in tandem. The MCU is now chasing down Marlo Stanfield, whose organisation has picked up from where Barksdale left off and now rules over most of the western district of Baltimore. However, their rise to power has apparently been accomplished with virtually no deaths, bemusing Lester Freamon. With the wiretaps also coming up empty, Freamon's attempts to follow the money trail attract the ire of his superiors and pretty soon the MCU is all but shut down and Freamon and Kima end up working in Homicide instead. Elsewhere, McNulty is enjoying the (relatively) easy life as a beat cop, Daniels is heading up his own force and Carver is maturing as an officer, with only Herc apparently resisting any change, at least until he catches the Mayor's eye (in a rather interesting manner) and finds his star rising as a result. But overall the police side of things, at least to start off with, seems pretty quiet. On the streets Marlo's rise to power has been achieved with the help of his two enforcers, the terrifyingly cold-blooded and ruthless Chris and Snoop, who have come up with a brilliant scheme to hide the resulting bodies from the police. Proposition Joe, who has inherited most of the surviving Barksdale crew, is continuing his efforts to entice Marlo into the cooperative to little avail, so he hatches a scheme to get Marlo on his side by setting up a war between him and the indefatigable Omar. Unfortunately, this leads to a pretty bloody and complicated state of affairs for all concerned. Elsewhere, Tommy Carcetti is running for the position of mayor, but the race is a difficult three-way contest between him, the incumbent Royce and fellow councilman Tony Gray. Unfortunately, no sooner is the winner in office then they are delivered two massive problems: how to handle the proven incompetence of police commissioner Burrell when they cannot fire him for political reasons, and the discovery that they have a jaw-dropping $54 million budget deficit due to overspending in the schools. At the same time, Prez, the former MCU member fired from the force in Season 3 after accidentally killing another officer, has started a new life as a maths teacher. His class is noisy, uncooperative, disrespectful and sometimes shockingly violent (one student slashes another's face open with a razor in his first week). However, the primary narrative for Season 4 focuses on four of the students in Prez's class - Randy, Dukie, Namond and Michael. These are all new characters, although with some ties to existing ones: Namond is the son of former Barksdale enforcer Wee-Bey and Michael is a member of Cutty's gym. The scaling back of the other characters in favour of following these four youngsters around may seem like an odd move, but it pays off brilliantly. Having tackled the police, criminals, politicians, and dockworkers, Season 4 is about teachers, students and the role of education in shaping the lives of the young. Early in the season a divide is identified between those kids who could make something for themselves and the corner kids who don't want to do anything other than stand on the streets and sell drugs to make money, and where the four main characters fall on that divide and how they swap sides and change over the course of the season is fascinating to watch. At first glance Michael seems to be the most positive and promising of the four, but his interest in sports and growing cooperation in class hides a bitter and painful home life that soon leads him into Marlo's circle, whilst happy-go-lucky Randy makes a series of mistakes that prove costly. In fact it's Namond, who is selling drugs from the start and being schooled for a life of crime by his father from behind bars, who undergoes the most interesting and seismic shifts in character, all depicted through the brilliant-as-usual writing and some fine performances from the young actors involved. Andre Royo as Bubs also has to be singled out for mention, as Bubs hits rock-bottom in this season and Royo's depiction of a man whose already crappy life disintegrates completely is absolutely stunning. At the same time, Dominic West's low availability for the season means that McNulty doesn't appear very much, meaning more screen time for Freamon (Clarke Peters) and Bunk (Wendell Pierce), which is a very welcome move. McNulty does return to prominence in the last two episodes, which set up the direction of the final season pretty well. The Wire: Season 4 (*****) is as superbly-written, brilliantly funny, expertly-acted and stomach-churningly tragic as ever, except possibly even moreso than the first three seasons. If there is a negative point, it's that Season 4 is the most epic and sprawling season to date, and it takes a while for all the disparate storylines to start pulling together. But when they do, the result is the most powerful and gripping final run of episodes yet. 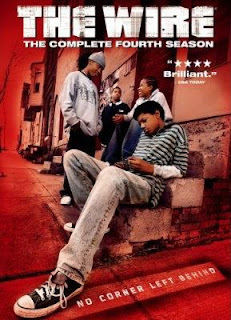 Season 4 of The Wire is available on DVD in the UK and USA and also as part of the complete series box set (UK, USA).